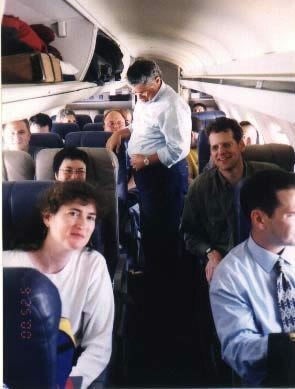 Scroll down to view an assortment of candid photos from Paragon’s 33 year career. We will add others from our “scrapbooks” as time permits. 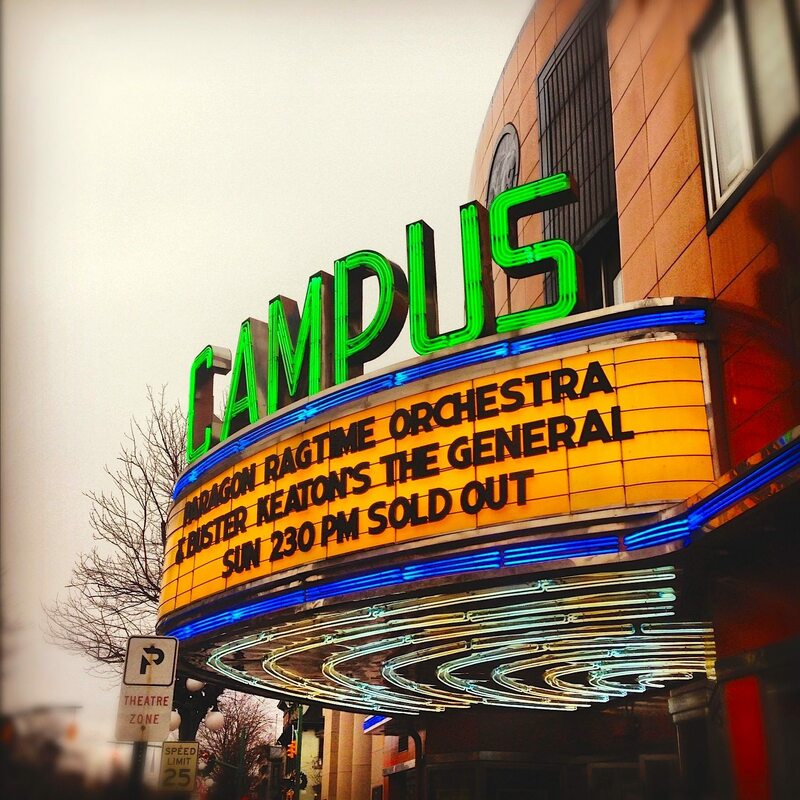 PRO’s final concert of 2012 – sold out. (December 2012). Photo courtesy Vasko Dukovsky. 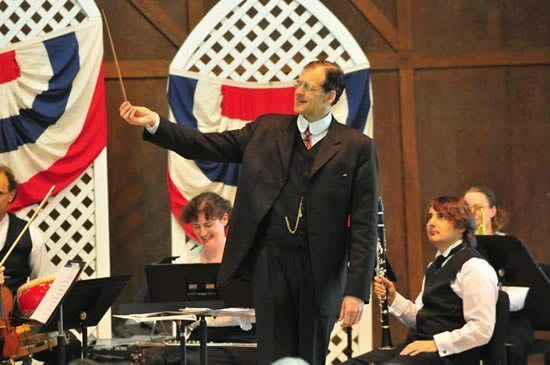 Conductor Rick Benjamin with PRO outdoors (July 2012). Photo courtesy Scott Williams. 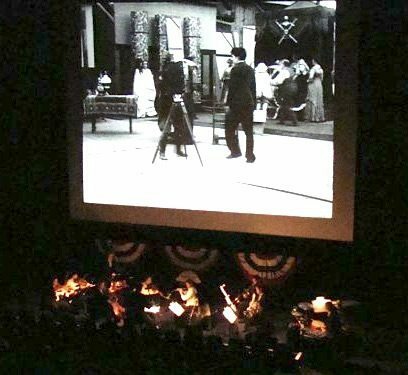 PRO performing its 600th silent film screening at Grauman’s Egyptian Theatre in Hollywood, California (February 27, 2010). Photo courtesy Bill Kelly. 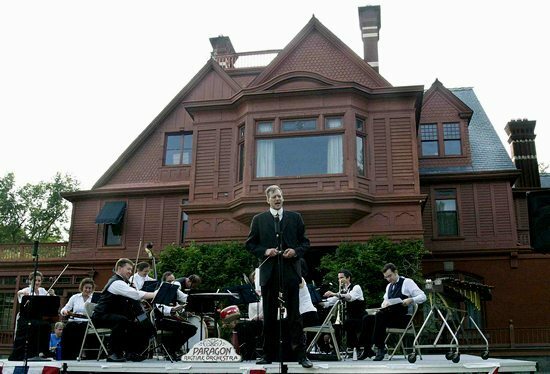 PRO honoring inventor Thomas Edison with special concert at his mansion in Orange, New Jersey (June 5, 2010). 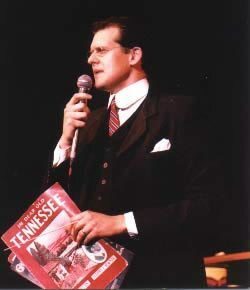 Photo courtesy U.S. National Park Service. 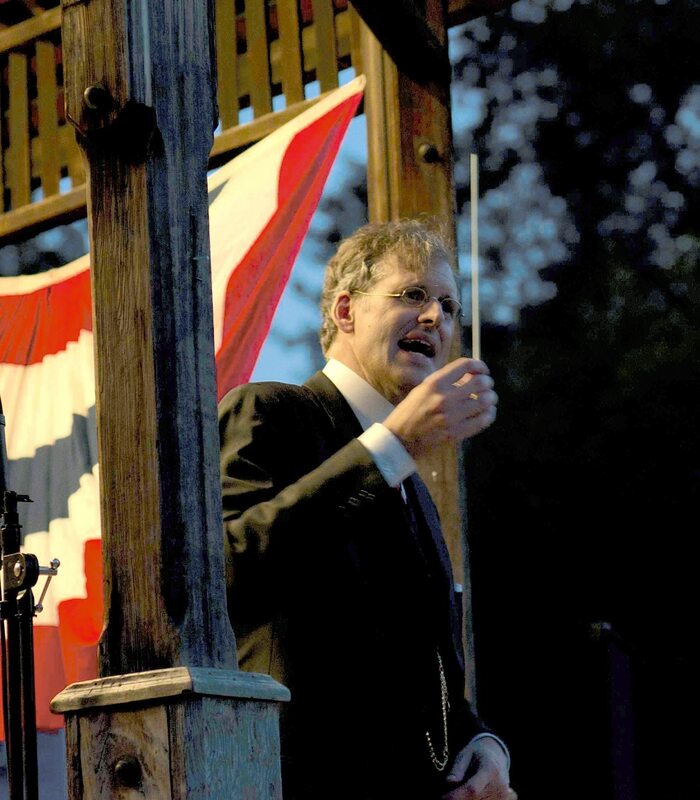 Rick Benjamin shows an audience his conducting baton, which was once owned by John Philip Sousa (August 2009). Photo courtesy Tiffini Scott. Rick Benjamin (kneeling, right) and the leads of the Opera Memphis production of Scott Joplin and Treemonisha. 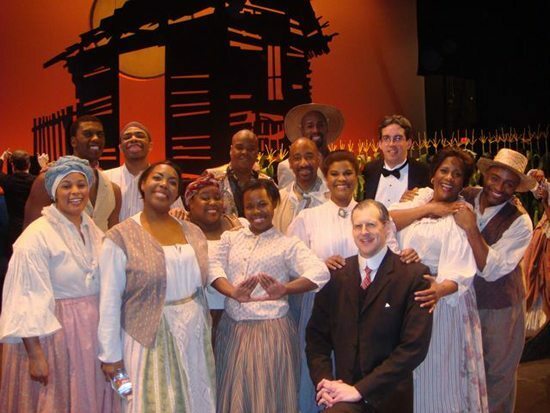 Mr. Benjamin orchestrated and conducted this production, which starred Anita Johnson and Jonathan Tuzo (January 2009). 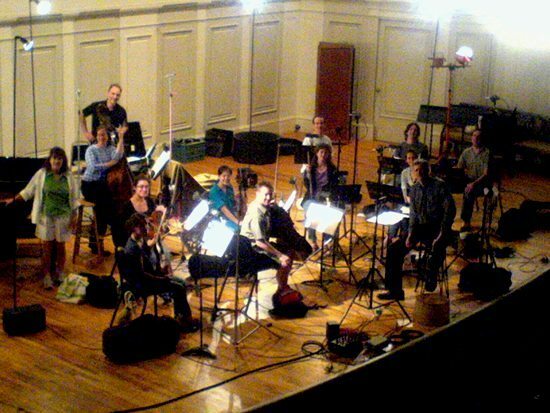 PRO recording their George M. Cohan historic recreation album at the American Academy of Arts and Letters (June 2008). 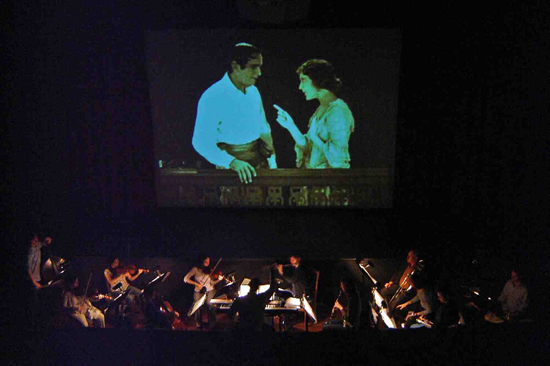 PRO in the ‘pit,’ playing the original score for Douglas Fairbanks’ 1920 silent film The Mark of Zorro (May 2008). 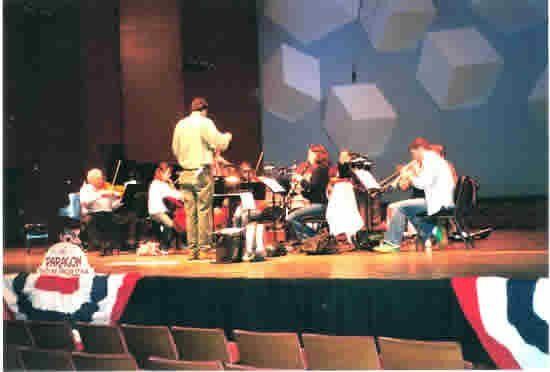 Mr. Benjamin rehearsing PRO in Minneapolis Orchestra Hall for one of the two PRO concerts presented there by the Minnesota Orchestra (September 2006; December 2007). 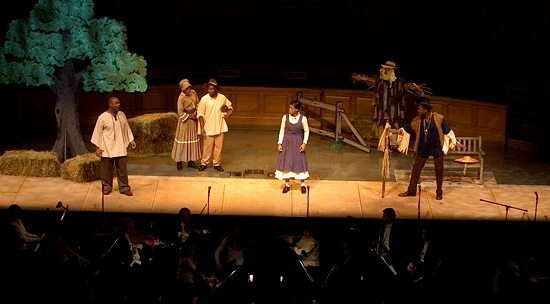 The Paragon Ragtime Orchestra’s own acclaimed production of Scott Joplin’s 1911 opera Treemonisha, featuring a new reconstruction of the score by Rick Benjamin; onstage at Wake-Forest University (October 2005). …still nice to see the name in lights. 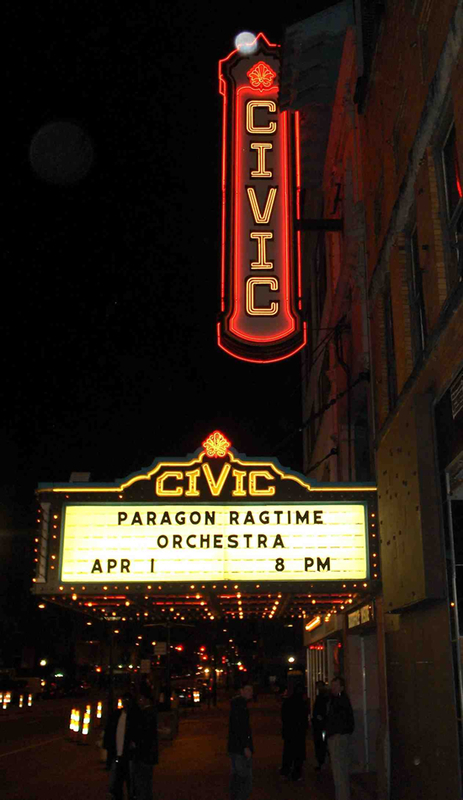 One of our favorite 1920s movie “palaces” – Akron’s Civic Theatre (2006). New York Debut! PRO at Lincoln Center’s Alice Tully Hall. 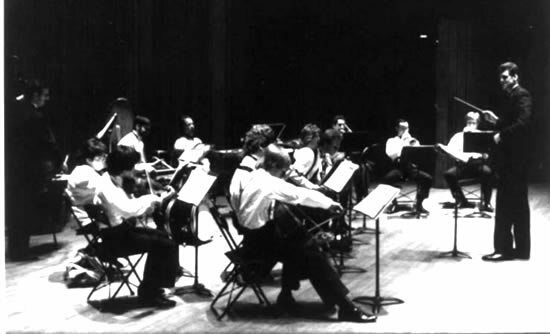 The New York Times‘ glowing review of this concert was a huge career boost (March 1988). 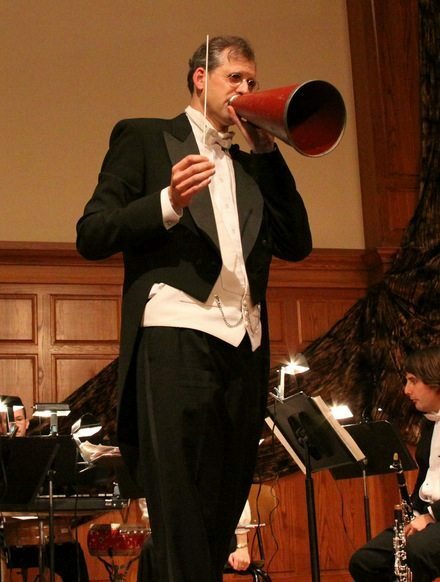 More usually, Mr. Benjamin relies on his period-correct megaphone. But what is he telling this audience? “TO THE LIFE BOATS!” perhaps? Except they’re in Kansas…(2008). 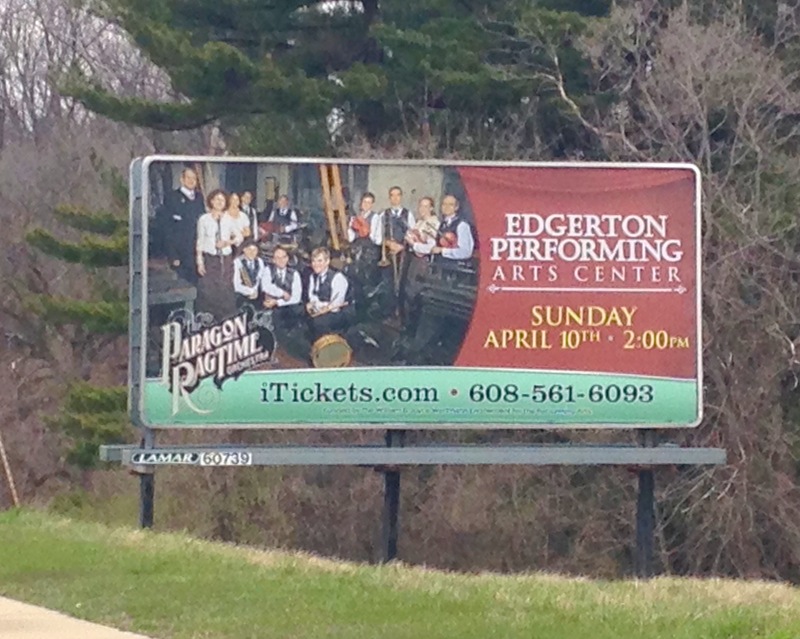 Photo credit: Hugh Pickens. 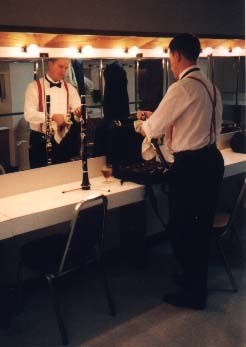 “Places for top of show!” – ace clarinetist Dave Griffiths readies for action at the Ravinia Festival (August 2001). 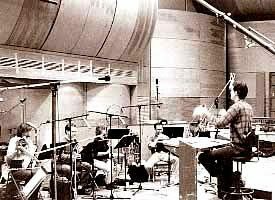 Rick Benjamin and the Orchestra recording their Whistler & His Dog CD in RCA’s famous “Studio A.” This recording has been enjoyed by millions as the “soundtrack” of Disney’s Main Street, U.S.A. at Disneyland, Disney World, and Disneyland Paris (1987). Rick Benjamin planning an upcoming concert in his c.1900 parlor. 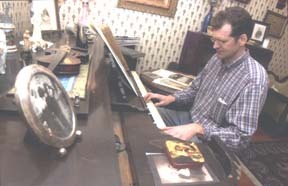 The piano is a fine 1872 Chickering, which he purchased in a Pennsylvania junk shop for $300 (2004). Photo Credit: The Daily Item. More than 4,000 people attended the PRO’s presentation of “Treemonisha” at San Francisco’s Stern Grove Festival (2003). Photo Credit: Hari Anuki. 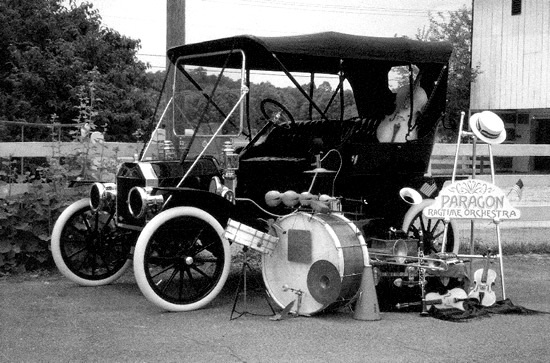 Model T delivery: PRO’s instruments “arrive” in this cover photo for the Orchestra’s 1995 CD Knock Out Drops. The auto is Dr. J. Stanley Stratton’s award-winning 1910 Ford; the Orchestra’s original 1910 Ludwig & Ludwig drum set is finally seen too. This historic instrument has been heard on all PRO’s recordings and concerts since 1990. 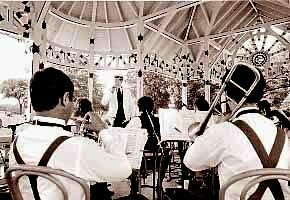 The view from the drummer’s seat in the bandstand at the Smithsonian Institute in Washington, DC (1989). Eureka! 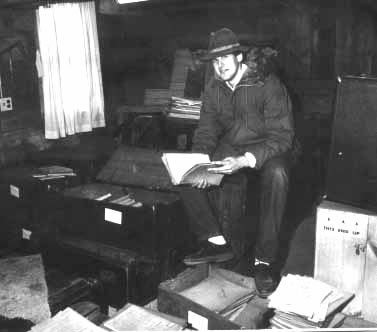 Rick Benjamin recovers the Capitol Theatre orchestra library – 26 large wooden crates stuffed with silent film scores – from a dusty Washington, DC basement (1992). The glamor of air travel! PRO enjoying the steerage section as usual. An irate portly civilian attempts to escape via the center aisle, enroute to Vancouver, B.C. (2002). 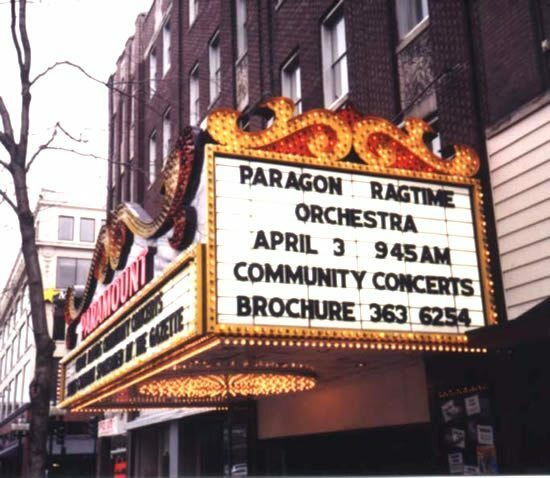 The name in lights – always a welcome sign on the road; in this case, at the historic Paramount Theatre in Cedar Rapids, Iowa (1999).